A total of eight steel composite bridges are being constructed as a vital component of the Aberdeen Western Peripheral Route. Steel tonnage: 1,350tCovering a distance of 58km, the Aberdeen Western Peripheral Route/Balmedie to Tipperty (AWPR/B-T) is the longest road building project currently under way in the UK. Designed to significantly improve travel in and around Aberdeen and the north east of Scotland, the scheme is being delivered by a joint venture that includes Balfour Beatty, Morrison Construction and Carillion. One of main reasons for the project is the fact that Aberdeen lies at the intersection of several major roads, including the A90 and A96 trunk roads. Currently traffic has to travel through the city, making journeys difficult and time-consuming. Meanwhile, the existing Balmedie to Tipperty road is recognised as a bottleneck. The single carriageway, which carries some 22,000 vehicles per day, is heavily affected by peak traffic flow during the morning commute. Alleviating these problems, the new AWPR/B-T will consist mainly of a new dual two-lane carriageway. However, the carriageway will be dual three-lane for a short section between the North Kingswells and Craibstone Junctions and between Charleston and the next junction to the south at Findon on the existing A90. The project provides a bypass for long-distance traffic while facilitating peripheral movement for shorter journeys, therefore removing traffic from both the city areas and unsuitable rural and urban local roads. Constructing such a long highway around a major conurbation brings with it the need for bridges – 75 to be exact on this scheme. Many of these structures are minor, but eight major bridges are steel composite structures fabricated, supplied and erected by Cleveland Bridge. The bridges vary in length but all have a similar steel composite design. They are constructed with pairs of steel braced girders supporting a concrete deck slab. All of them are single-span bridges with the exception of the two-span A93 North Deeside Road Overbridge. In order to fit in with the overall construction programme, bridge construction has been sequenced with Cleveland Bridge erecting four structures last year and then completing its work this Spring. During 2016, Cleveland Bridge delivered and installed the steelwork for four bridges, the A93 North Deeside Road Overbridge, the Craibstone Junction Underbridge, the A96 Aberdeen-Inverness Trunk Road Underbridge and the B977 Echt-Balmedie Road West Overbridge. Two of the initial bridge structures to be installed, the B977 Echt-Balmedie Overbridge and the A96 Aberdeen-Inverness Underbridge, both required assembly of girders adjacent to their final position. For the former bridge, the steel was brought to site in four braced pairs of plate girders, each pair being 3.2m wide. 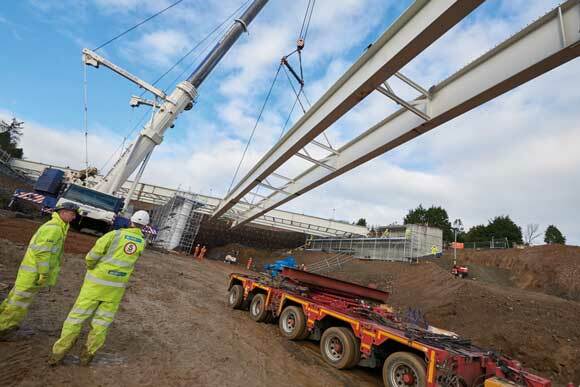 They were joined on site, using a 250t-capacity mobile crane to form two 57m-long braced pairs of girders. These were then installed over days using a 500t telescopic crane. The A96 bridge is a single span structure requiring five pairs of plate girders. The steelwork was taken to site in lengths of 36m and 12m, which were spliced together on two plots adjacent to the bridge’s final position. Installation of this bridge required the use of a 800t-capacity lattice boom crane. The bridges that are yet to be installed this year are: the A956 Charleston Overbridge, and the Blackdog Junction North Underbridge and South Underbridge, structures that form both parts of a roundabout junction. The final bridge structure in Cleveland Bridge’s programme is the A90 Aberdeen-Dundee Trunk Road Underbridge at Stonehaven, which is due to be completed this Spring. A93 North Deeside Road Overbridge – Steel tonnage of 300t and consists of three pairs of two-span plate girders that were installed using a 500t-capacity crane. The fully painted pairs of girders measure 4.8m wide and were delivered to site in 46m and 29m lengths. Craibstone Junction Underbridge – Steel tonnage of 301t and consists of five pairs of weathering steel plate girders that were taken to site as braced pairs measuring 3.25m wide and 42m long. A96 Aberdeen-Inverness Trunk Road Underbridge (above) – This is the heaviest structure with a steel tonnage of 811t. It consists of five pairs of weathering steel plate girders 3.2m wide and 48m long. 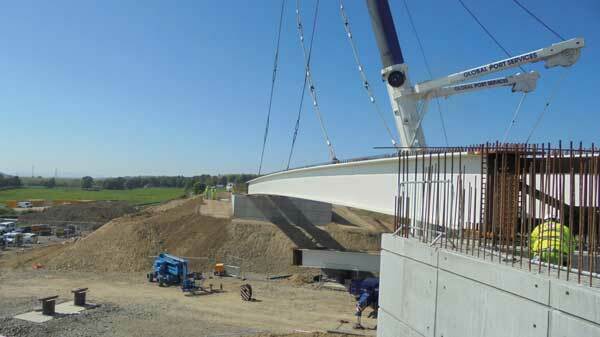 B977 Echt-Balmedie Road West Overbridge (below)– A fully painted structure with a tonnage of 210t. Consists of two pairs of plate girders measuring 3.2m wide and 57m long. The A90 Aberdeen-Dundee Trunk Road Underbridge at Stonehaven – Steel tonnage of 312t, this structure consists of five pairs of fully painted plate girders that were brought to site in 3.8m wide × 40m lengths. 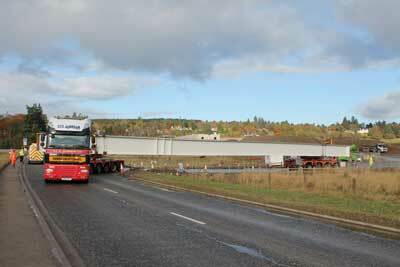 The A956 Charleston Junction Overbridge – The second heaviest structure with a 518t tonnage. Consists of seven pairs of weathering steel plate girders brought to site in 3.8m wide × 50m lengths. The Blackdog Junction Underbridge (North) – Weighing 197t, this structure consists of three pairs of weathering steel plate girders brought to site as 3.8m wide × 44m lengths. The Blackdog Junction Underbridge (South) – Consists of three pairs of weathering steel plate girders brought to site in 3.8m wide × 46m lengths. Tonnage of 215t.